Worldwide, the number of poor people increased during the past decade, despite technological improvements, more open trade, and improved policy frameworks in developing countries. Regional conflicts, adverse shifts in terms of trade, and marginalization of poor countries in the new global economy explain this outcome. This highlights the need to reform development assistance and improve its effectiveness. Making Development Work examines the four key principles of the Comprehensive-Development Framework, a World Bank initiative currently being piloted in twelve developing counties. The initiative promotes a holistic long-term vision of development, domestic ownership of development programs, and focus on results; and stronger partnership between government, the private sector, and the civil society. 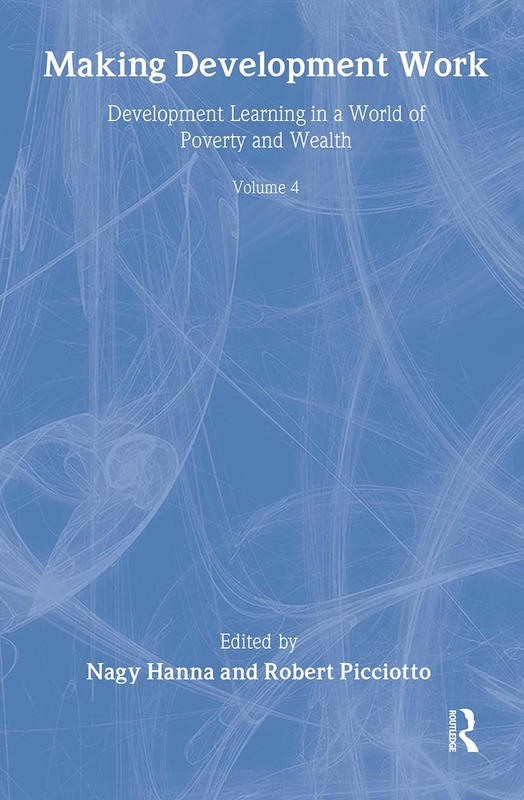 The first section of the volume describes the evolution in development thinking that culminated in this new consensus. The second focuses on country ownership of development policies and programs. Based on empirical evidence, it proposes a new view of the aid relationship as a mutual-learning process. The third section focuses on results and on the ways aid agencies might enhance development impact of their operations. It concludes with a preliminary assessment of strategies for scaling up from specific projects to sector and programmatic approaches, and suggests ways to adapt them to counter conditions. The experience of a bilateral aid agency, U.S. Agency for International Development (USAID), is examined in this context. The fourth section focuses on partnership, emphasizing that aid agencies must be explicit about the kinds of partnerships they seek with countries and the kinds of strategic selectivity they will exercise. The final chapter pulls together the lessons of development experience at various levels of operation. It outlines key tensions between comprehensiveness and selectivity, ownership and conditionality, speed and broad-based ownership, focus on results and poor local evaluation capacity, and enhanced country focus and globalization. Promising approaches to manage these tensions are put forward to replace one-size-fits-all prescriptions with client empowerment and social learning. Making Development Work offers rich lessons on improving the effectiveness of aid. It will be of particular interest to development practitioners, students and professors of development economics studies. Nagy Hanna is a lead corporate strategist and evaluation officer at the World Bank. He has published extensively on development, management, and knowledge. Robert Picciotto is director-general of Operations Evaluation at the World Bank.